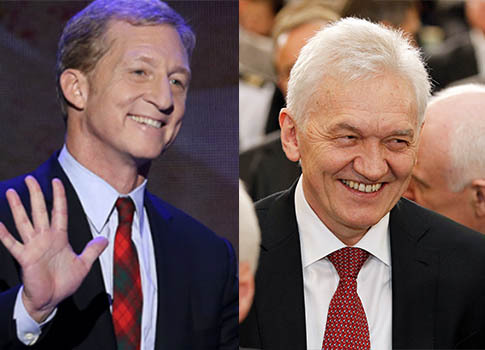 The hedge fund founded and, until recently, run by billionaire environmentalist Tom Steyer was involved in a deal to sell a stake in a Russian oil company to a Russian oligarch who is the target of U.S. sanctions. Farallon Capital Management sold a part of its stake in Russian firm Geotech Oil Services to the Volga Group, a Luxembourg-based investment firm owned by Russian billionaire Gennady Timchenko, in 2010. Four years later, in April 2014, the U.S. Treasury Department announced that it would target Timchenko, Volga, and a number of companies associated with them, in a round of sanctions aimed at punishing Russia’s inner circle of oligarchs for the government’s invasion of Crimea. Timchenko has been "acting for or on behalf of or materially assisting, sponsoring, or providing financial, material, or technological support for, or goods and services to or in support of, a senior official of the government of the Russian Federation," according to the Treasury Department. Farallon has a long—and troubled—history in Russia. It was targeted for legal action by the Justice Department in the early 1990s after it used U.S. government resources to influence post-Soviet economic policy in the country in ways that benefitted Farallon. The fund’s ties to Timchenko could raise more questions about its activities in the country as U.S. lawmakers seek to dent Russia’s energy sector, which experts say the Kremlin uses to assert its influence in Europe. According to top U.S. lawmakers on both sides of the aisle, Russia’s recent invasion of Crimea demonstrates the necessity of building the Keystone XL pipeline, which Steyer vehemently opposes and is trying to scuttle through massive donations to the Democratic Party. "Americans look at what’s happening in Russia and Ukraine—I think it sends shivers up their spine and it should," said Senate Energy and Commerce Committee chairman Mary Landrieu (D., La.) on Tuesday in remarks on the pipeline. Rep. Paul Ryan (R., Wis.) recently said that approving the pipeline would send strong signals to the Kremlin. "The signal is very, very important," Ryan told CNN in March. "I think showing that [the invasion of Crimea] is going to make us move in that direction helps give our allies the kind of resources they need, and reduces Russia’s grip on this." Steyer has vowed to raise $100 million for Democrats who oppose the pipeline, which the American people widely support. His involvement in a political battle that lawmakers are seeking to tie to Russian energy policy could revive scrutiny of his hedge fund’s involvement in the country’s energy sector, which accounted for 52 percent of federal budget revenue and over 70 percent of the country’s exports in 2012. Farallon was part of a consortium of investors that provided $100 million in financing for Geotech in 2008. According to Integra Group, a company with which Geotech later merged, the financing was used "to support expansion plans." Later that year, the consortium bought additional Geotech shares, bringing their combined ownership to 23 percent. Two years later, Farallon sold "part of their investment … to Volga Resources," according to Russian corporate attorney Anton Rogoza, who advised Farallon on the deal. Volga purchased shares from Farallon, two other foreign investors in the company, and Geotech’s senior management. Russia’s endemic corruption—the country is tied with Pakistan for the 127th spot on Transparency International’s 2013 Corruption Perceptions Index, just ahead of the Ivory Coast—makes an investor with such deep ties to Putin a valuable asset. "Timchenko’s activities in the energy sector have been directly linked to Putin," the Treasury Department said in a statement on U.S. sanctions, which dubbed him a member of Putin’s "inner circle." Timchenko "is rumored to be a former KGB colleague of Putin's," according to a 2008 State Department cable released by Wikileaks. Additionally, oil trading firm Gunvor, which Timchenko owned until March, "is rumored to be one of Putin's sources of undisclosed wealth." Timchenko dumped his Geotech shares late last year, and continued selling his stakes in companies eventually targeted by U.S. sanctions before those sanctions went into effect. Volga reportedly made $40.6 million on the sale of its Geotech stock. A Farallon spokesperson did not respond to a request for comment by press time. The hedge fund’s investment practices have come under increasing scrutiny since Steyer gave up day-to-day control and established himself as one of the foremost political financiers in the country. Steyer’s critics have pointed to Farallon investments in coal-fired power plants, for instance, to allege hypocrisy on his part. Farallon was also named as a defendant in a lawsuit alleging it was complicit in a $67 million fraud scheme. This entry was posted in Issues and tagged Keystone, Mary Landrieu, Paul Ryan, Tom Steyer. Bookmark the permalink.